Ben Spencer is a writer living in Concord, NC, with his wife and daughter. His work has appeared in multiple on-line literary magazines. His work has also been nominated for the Pushcart Prize. Alright gang, thanks for stopping by and visiting my new website, benspencerwrites.com. If you’d like to receive updates when I post news on the site, follow my blog over at the sidebar on the right, and you’ll receive an email notification anytime I post an update. Now, to the main event. Over the last six months I’ve been working on an Epic Fantasy series of novellas entitled THE DEER KING. The map on my website (imagined by yours truly but brought to life by the talented graphic designer, Doyle Hinkle), details Dreyland/Tsadanali, the world in which THE DEER KING series takes place. The concept centers around a colonial world where various indigenous people have thus far withstood the arrival of a foreign power from overseas. One of the native groups, the Massaporans, holds fast to its culture and way of life by relying on the strength of a reincarnated warlike god, The Deer King. Drawing on my fascination with colonial America and my love of genre-bending literature, I hope to create a compelling world stocked with fascinating characters and engrossing storylines. My goal is to write each novella in a way that permits it to both stand on its own and strengthen the overall series. I’ve created a world rich with history, and I believe that readers who invest their time will come away satisfied. The first three novellas will be released in the summer of 2018. My initial goal is ten novellas, with a new novella being released every four months after the rollout next summer. That’s it for now. I know this is quite a radical departure from my earlier works, but I’m excited for the change. I also have a short story forthcoming over at Corner Bar Magazine, entitled “This Horrible Hunger.” It should be out in the next month or two. If you want to know more, scroll down. Details are in an earlier blog post. 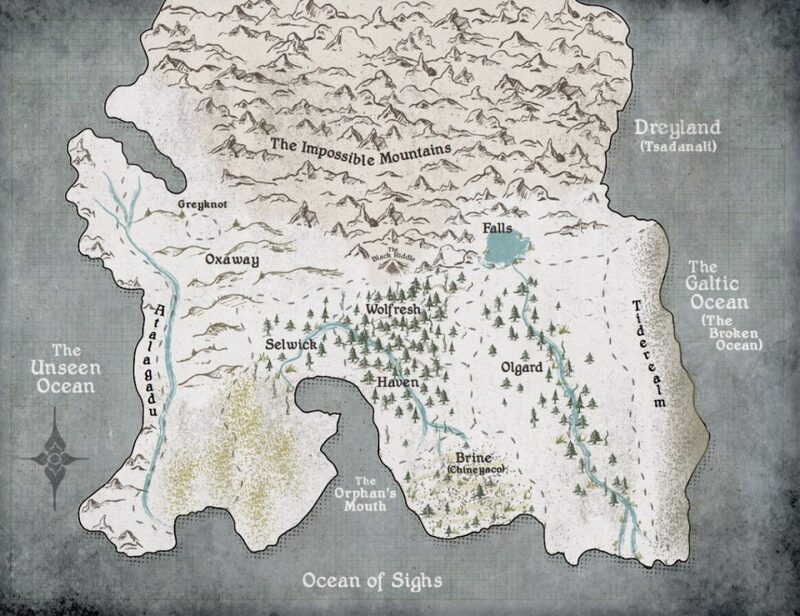 Here’s a look at the map of Dreyland/Tsadanali. My short story, “Fated to Shine,” is up over at Scholars & Rogues. The story is about a high school baseball phenom who would rather read Vonnegut and Orwell than play baseball. Check it out if you get the chance.